How about a trip to some secluded spot away from the commercialised world into the sphere of relaxation and refreshment? If you are looking for a similar destination, then it is advisable to embark on a journey from Bhopal to Barwani, which is entirely filled with interesting and soulful spots. Located on the banks of Narmada river, Barwani is believed to be an ancient settlement and is famous for its pilgrimage destinations today. Surrounded by lush green beauty of the Satpura Range and patched with the beautiful meadows of central Madhya Pradesh, Barwani is also known as the Paris of Nimar on account of the heavenly presence of nature. Due to its beautiful weather, especially during the monsoon season, it is a perfect destination for every tourist who is looking forward to finding inner peace amidst devotion and tranquillity. Located in the central part of India, Barwani experiences hot summers. However, due to its religious significance, this beautiful town of Madhya Pradesh is a year-round destination for devotees, especially Jain followers. Nature lovers, who come here to enjoy a pleasant climate and natural surroundings, should visit in between the months of October and March. By Air: You can take a direct flight to Indore Airport and then from there you can hire a cab to Barwani, which is located at an approximate distance of 170 km from the airport. By Rail: You cannot get direct trains from Bhopal to Barwani and hence, you need to catch a train from Bhopal to Indore Junction and then from there, either a bus or a taxi to Barwani. By Road: With a good road network, Barwani is easily accessible by road and is located at a distance of about 350 km from Bhopal. So, you can take either of these 3 routes. However, it is advisable to take route 1 as you can reach your destination within 6 h, i.e., 1 h lesser in comparison to route 1 and route 2. On your way to Barwani, you can also take a break at Indore and Maheshwar. Indore is one of the most prominent cities in Madhya Pradesh on account of its historical significance and commercial importance. Being a historic city, you can find numerous places of interest here. The major places here include Rajwada Palace and Daly College. Even though it has been flourishing as a major commercial centre, the natural beauty of Indore is still intact. Hence, it houses several natural spots too in the form of lakes and waterfalls, which include Patalpani Waterfall, Atal Bihari Vajpayee Regional Park and Indore Lake. You must take a break here if you are looking to freshen up amidst stainless space of nature. Indore is located at a distance of about 195 km from Bhopal and 155 km from Barwani. Maheshwar is another pilgrimage centre in Madhya Pradesh which is visited by millions of tourists every year. Famous for its spiritual places, religious temples, serene ghats and other ancient marvels, Maheshwar is the perfect place on your way to Barwani if you are looking to get completely immersed in devotion and equanimity. Located on the banks of Narmada river, Maheshwar is all set to surprise you with its majesty and grandeur. It is located at a distance of about 280 km from Bhopal and 100 km from Barwani. So, once you are within the boundaries of Barwani in Madhya Pradesh, you will be exposed to the best of natural beauty sprawling in the form of forests and grasslands. 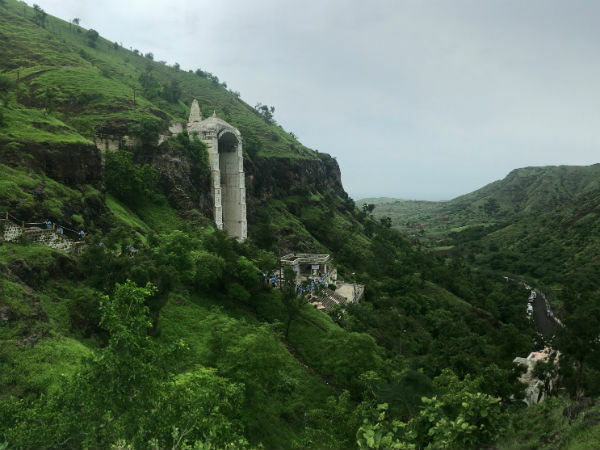 Even though Barwani is famous amongst locals and other tourists as a Jain pilgrimage centre, it still attracts several nature lover and adventure seekers too, due to the presence of rugged terrains and hilly regions. Following are the must-visit places here which every traveller should consider exploring. Bawangaja is the prime attraction of Barwani district and is located at a distance of about 8 km from the city centre. It is a popular Jain pilgrimage centre and is known for housing the world's largest megalithic statue of Lord Rishabhadeva, who was the first tirthankar in Jainism. This statue was carved out of a mountain and touches a height of 84 feet. You must catch a glimpse of this magnificent marvel standing atop the hills of Satpura Range. Bawangaja is a complex of 11 temples and Chulgiri Temple is one amongst them, which houses idols of other tirthankaras in Jainism. How about trekking up Bawangaja? Bandhan Waterfall is another beautiful spot near the core settlement of Barwani and is visited by hundreds of tourists every year. Gushing down the rocky terrains amidst rich vegetation, Bandhan Waterfall helps in enhancing the overall charm of the place, thereby, making the spot more photogenic. Apart from exploring the beauty of Jain pilgrimages and Bandhan Waterfall, you can also unveil the beauty of Maa Vaishno Devi Mandir, Rajghat, Beejasani Durga Temple, Shuvimor Waterfall and several other temples, such as Ganesh Mandir, Ram-Krishna Mandir, Shree Sanwariya Mandir and Kalika Mata Mandir.